As the daughter of a crime lord, Amara Resnova has endured the cruelty of her father’s enemies—and has tried to escape that world ever since. Now, she must reach out to the one man who saved her life, even if she’s never forgiven him for breaking her heart. But Amara is tougher today than she was then. She’s also more desirable to Rory—and dangerous to love. Can he protect her from her father’s enemies without surrendering to his own passions… or will love seal their fate for good? This is an interesting thriller. I had a more difficult time getting into the story simply because of how it was written. It felt that we were dropped in to the middle of the story. So, while it took me a good chunk of the first part of the book to really get into the characters and their story, I did end up enjoying it. Rory has been living in distress since he pulled Amara out of the pit she had been thrown in after she was kidnapped and left for dead. He had to be away from her and despite wanting her with every fiber of his being, he simply was unable to go to her due to a manipulative boss. Amara has been living a walking nightmare since her kidnapping. She cannot remember what happened for the last year. Her memory has been blank since that night. One thing that hasn't been blank are her vivid dreams. She dreams of Rory and doesn't know what to believe – did she love him? Who was he to her? As the story unravels, you get to see more and more of who Rory and Amara were before the incident and who they have become. Both are strong in their own way and when the culmination of their love and tragedy is revealed, you want to hold them each and watch them get the happiness that they deserve. I hope that the brothers get their own stories in the upcoming books. This book could be considered a spin-off of the Elite Ops series as many of the characters are revisited in this book. It’s been a while since I've read the Elite Ops series and I think I would have benefited from a re-read to familiarize myself again with all the characters. There is a lot going on in this book: torture, betrayal, and memory loss. Riordan Malone works for Elite Ops and during one his missions, he fell in love with the beautiful Amara Resnova. While doing a side job for her father, Amara is kidnapped and during the rescue, Riordan is hurt. Now, six months later, Amara shows up on his door and the only thing she knows is that he is the only one who can protect her from the people who are still trying to kill her. Riordan doesn't understand what caused Amara's memory loss or her father's lack of concern about her safety. Not trusting anyone else with her safety, Riordan is determined to get to the people who are targeting his lover. Lots of twists and turns that make you want to keep reading until all hours of the night. 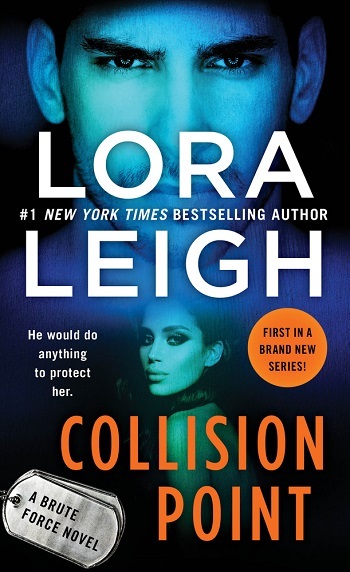 Reviewers on the Wicked Reads Review Team were provided a free copy of Collision Point (Brute Force #1) by Lora Leigh to read and review.